In a bowl combine 400 g Sour Cream, 3 Eggs, Salt, fresh Pepper and Nutmeg. It's a traditional dish served to the fresh grape cider in the fall in Franconia. I have so wanted a recipe for this yummy treat I indulged in every harvest time with federweißer when I lived in Biebelried! I had onion tart on our last trip to Berlin and I loved it! It was a light dough with custard on top. Very savory! I tried this recipe and it was more like bread with onion topping? What did I do wrong. You actually did nothing wrong. 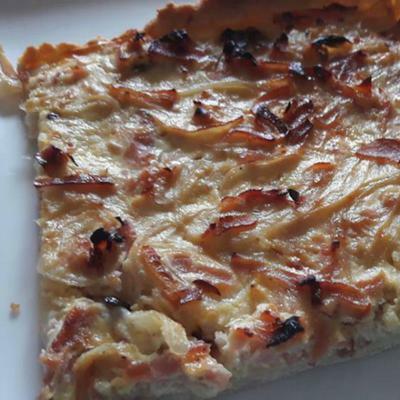 The above recipe is for the onion tart that is famous in certain parts of Germany. What I think you're actually referring to is Flammkuchen. The "custard" on top is usually a type of crème fraîche, but Greek yogurt works well. Give this recipe a try. I think you'll like it. NIcole, that sounds sooooo gooood! It reminds me of the first time I had this on my first trip back to Germany many years ago. Together with the Federweisen ... a real feast!